March 13, 2014 – Construction on the new Tullamore D.E.W. Distillery in Tullamore, County Offaly, Ireland has reached a milestone with the installation of four new pot stills this week. William Grant & Sons started planning for the distillery shortly after acquiring the Tullamore Dew brand from C&C International in 2010, and began construction last year on the project to bring whiskey production back to Tullamore 60 years after the original Tullamore distillery closed in 1954. The original Tullamore stills were moved to Kilbeggan for display when the old distillery was demolished to make way for a shopping center. 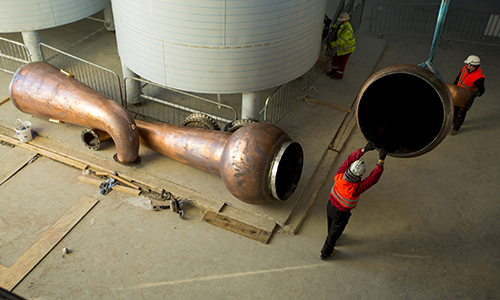 The new distillery’s stills were moved in pieces from the Forsyths shop in Rothes, Scotland, where they were built to replicate the original stills as closely as possible. When the distillery goes into production later this year, it will be able to produce 1.84 million liters of alcohol each year. In a news release, William Grant & Sons chief executive Stella David said “the arrival of the stills marks another step towards the return of the whiskey making tradition to Tullamore. We are excited to be marking this momentous event in a journey that has been almost 3 generations in the making”. Since acquiring the Tullamore Dew brand, Grant’s has rechristened it with the initials of Daniel E. Williams, who was one of the original distillery managers. His initials became part of the Tullamore Dew brand name during his 60 years at the distillery, which was also known as the B. Daly Distillery after Capt. Bernard Daly, the owner who named Williams as his distillery manager. When the original Tullamore distillery closed, production of Tullamore Dew moved to the Powers John’s Lane Distillery in Dublin and eventually to the Irish Distillers facilities in Midleton, where it is still produced under a long-term contract between Irish Distillers and William Grant & Sons. Editor’s note: Thanks to Heidi Donelon of the Ireland Whiskey Trail for historical details on the original Tullamore distillery.